Sunny Anderson shows us that behind every great soldier is a good meal! It's a very special personal and patriotic journey for Sunny as she travels to Ft. Bragg, North Carolina and Fort Lee, Virginia to look back on her time in the military, celebrate our men and women in uniform, reconnect with her active duty family members, and show us why food is often the glue that holds military families together. 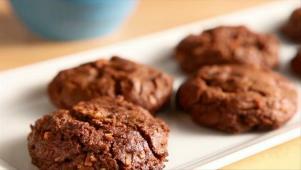 Sunny's German Chocolate Cake cookies taste like the classic dessert.